Of all your outdoor planters, it's the window boxes that will be on full display throughout the year. If your window box doesn't look good, your house won't look its best, and the curb appeal police (or your HOA) will be complaining at your front door. Front yard boxes and container plants should be well designed, with plants changed-out every season or more often to keep the display fresh. If flowers are spent, leggy, dried out, and it looks like you're growing a doll-sized tumbleweed patch, it's time to either get rid of the box or learn how to arrange the right plants for your region and for the right season. Get to work! 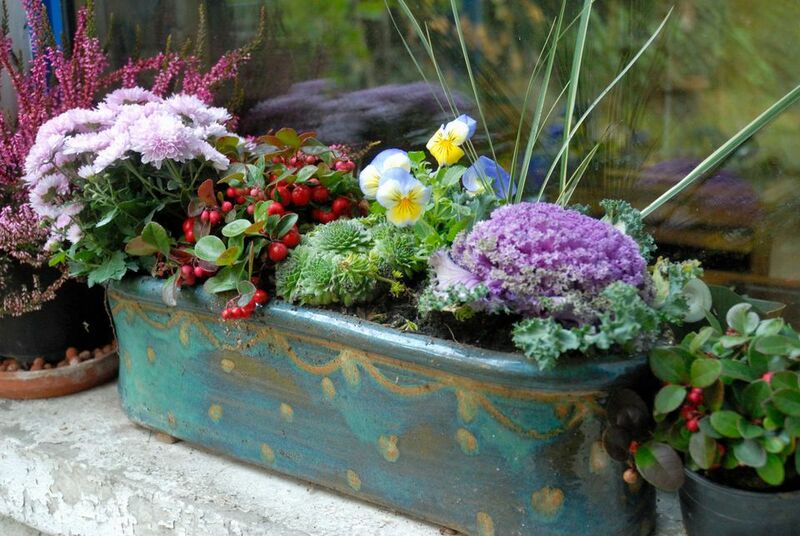 We've gathered 18 diverse and beautiful window boxes to give you ideas for fall. The Minneapolis-based design firm Botanical Blitz focuses on outdoor floral arrangements and displays, creating growing works of art and changing out plants for clients each season or more often. Large planters on an urban deck featuring eye-catching plants like lime green sweet potato vine (Ipomea), ornamental grasses, mums, coreopsis, and trailing needlepoint ivy. Yellow chrysanthemums, dwarf ornamental grasses, and ornamental kale provide rich, deep tones of autumn. Small pumpkins are tucked in as a reminder that Halloween and pumpkin pies are around the corner. 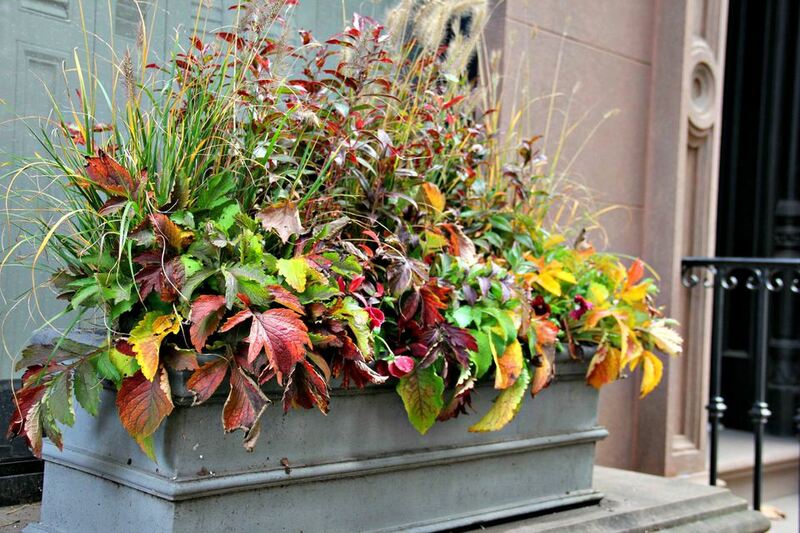 Kris Jarrett of Driven by Decor believes that layering plants will result in the most attractive window boxes. The boxes at her Connecticut home are hung high, which prohibits her from planting taller thrillers (using the thriller, filler, spiller method), as they'd cover up the bottom part of the window (and block the view from indoors). Adding to the challenge: the boxes are shallow, meaning whatever is planted can't develop deep roots. Her solution: cabbage, kale, chrysanthemums, ornamental peppers, gourds, and pumpkins. Jester's Crown fern, green and white caladium, white mums, cut Annabelle hydrangea flowers, dried Astilbe flowers, frilly ornamental kale, and a fat white pumpkin create a variety of textures and greens in a fall window box arrangement by Linda of Q is for Quandie. She recommends this arrangement for early fall up until frost; the first hard frost will kill the caladium. Since tulips don't grow in the fall, Elizabeth of Pretty Pink Tulips keeps the trailing ivy and other plants in her window box, going for an easy update with mums and pumpkins. Liz Latham of Hoosier Homemade likes to use odd numbers (a good design rule) for her Indiana home's window boxes. For fall, she uses larger pumpkins and gourds in the middle and at each end, mum plants, and dried hydrangea flowers tucked into a bed of hay and dried grasses that spill over the box for a fun look. Bria Hammel Interiors, based in Mendota Heights, Minnesota, created a stunning lavender/purple and white autumn window box using chrysanthemums, different varieties of ornamental kale and cabbage, white pumpkins, and pale gourds. Jane and Leo Windham of Cottage at the Crossroads are do-it-yourselfers who love to make beautiful things happen in their yard. Their fall window box includes gourds grown in the garden, English ivy, creeping Jenny, foxtail fern (aka asparagus fern), and annual additions of orange marigolds. Snapdragons, million bells, sweet alyssum, and purple pansies grace a brick red-colored window box on Church Street in Charleston, South Carolina. A few mainstays remain along with the mushroom-shaped garden ornaments, but this box is freshened up for fall with yellow-orange coreopsis, ornamental peppers, red-stemmed euphorbia (spurge), pimply yellow gourds, and cream and orange mini pumpkins. Rust-orange, yellow, and lilac mums are teamed with beautiful deep-purple million bells (Calibrachoa) and a pumpkin for a charming arrangement. A bay window is adorned with three window boxes, each planted identically with ornamental grasses that create a fountainlike effect, trailing sweet potato vine, and creeping Jenny. In some parts of the southwestern United States and other regions with mild winters, succulents thrive outdoors throughout the year. A window box planted in autumn with colorful succulents will grow during the winter and produce flowers in early spring. This box features a variegated pelargonium (the red and green leaves; not a succulent), flower-like Aeonium, blue-chalk Senecio, and Duddleya. Beth Schelle of Indigo Gardens and Design in South Bend, Indiana places gourds and pumpkins in various patterns, colors, and shapes in a long window box. Evergreens and arborvitae are tucked in to soften the look. Florence and Cecelia of Brooklyn Window Boxes by Flo's Gardens have been designing outdoor containers for many years and absolutely know what they are doing. In the back go the taller grasses or shrub-like plants, while two mid-size plants fill the middle. Up front are three smaller trailing or spilling plants–a mix of flowers and greenery or the same of one or the other. Dark pink and purple chrysanthemums are planted with tropical looking, leather-leaf Crotons, which make a striking backdrop. Geraniums are hardy and can live long lives–decades, in fact. Pruning spent flowers will keep your geraniums looking their best–a must for window boxes that everyone passing by will see. A classic red geranium (actually a pelargonium) shares space with yellow lantana and blue salvia, which all continue to bloom in early fall.